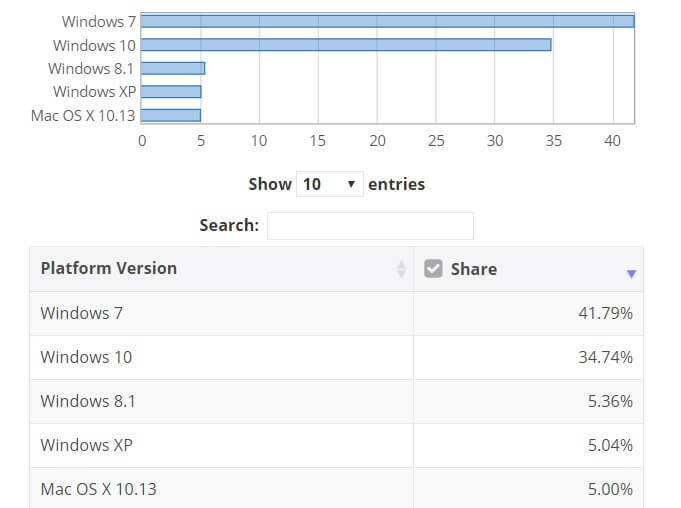 The good news is that Windows 10 continues to steady progress in taking over the reins from Windows 7, and while Windows 10 is already the most popular desktop operating system on StatCounter, another analyst firm NetMarketShare says the OS is yet to overtake Windows 7. Although Microsoft is investing both money and time in its cloud services, that doesn’t mean the company has given up on its desktop operating system and Windows is unimportant to its strategy. Microsoft still cares about Windows 10 and the company is also paying attention to market share numbers. AdDuplex recently reported that Windows 10 April 2018 Update is already on 50% of devices. It appears that Windows 10 April 2018 Update has also helped the platform in the OS market. NetMarketShare’s May report shows that Windows 10 has managed to improve its presence in the OS market, and now it holds 34.74% market share. Windows 10 achieved 34.74 percent share in May 2018, up from 33.81 percent in April 2018. The market share of Windows 10 has increased by almost one percent and it’s a good news given that Windows 10 April 2018 Update is still rolling out. It appears that Windows 10 is growing at expense of Windows 7 as the latter saw a drop from 43.45 percent to 41.79. Interestingly, Windows XP rose from 4.36% to 5.04% and Windows 8.1 also saw an increase from 5.25% to 5.36%. It’s quite obvious that Microsoft won’t be able to achieve its original goal of a billion Windows 10 users anytime. The company recently said that more than 700 million devices are powered by Windows 10, and it continues to climb in market share. Windows 7 is likely to lose its market share in the enterprise segment given that Microsoft will stop supporting the OS in 2020. The businesses also continue to migrate from Windows 7 to Windows 10.